Box Text: Think outside the box to save a world in peril! Think outside the box to save a world in peril! Traverse tricky landscapes by creating boxes to help Qbby navigate more than 20 puzzling worlds. Just watch out—tons of obstacles stand in your way, so fortify yourself with a Shielding Afro or other boxy defenses. Then beat some more stages to earn sweet square costumes, like a superhero outfit! After snaking your way through a plethora of levels, try taking on some challenges. Time attack will have you puzzle-solving your way through an assortment of levels as quickly as possible, giving you the chance to test your skills at creating box-shaped defenses. If that’s not enough, Score Attack has you collecting as many tokens as possible within the time limit while using boxes to lift yourself up and maneuver around a huge stage. All the world’s a puzzle and you’re the only box boy boxy enough to save it! 04-08-2015 desocietas Box Text Think outside the box to save a world in peril! Think outside the box to save a world in peril! Traverse tricky landscapes by creating boxes to help Qbby navigate more than 20 puzzling worlds. Just watch out—tons of obstacles stand in your way, so fortify yourself with a Shielding Afro or other boxy defenses. Then beat some more stages to earn sweet square costumes, like a superhero outfit! After snaking your way through a plethora of levels, try taking on some challenges. Time attack will have you puzzle-solving your way through an assortment of levels as quickly as possible, giving you the chance to test your skills at creating box-shaped defenses. If that’s not enough, Score Attack has you collecting as many tokens as possible within the time limit while using boxes to lift yourself up and maneuver around a huge stage. 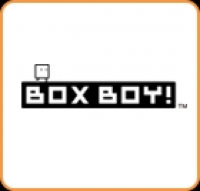 All the world’s a puzzle and you’re the only box boy boxy enough to save it! 04-04-2015 kevininja Name Box Boy! This is a list of VGCollect users who have BOXBOY! in their Collection. This is a list of VGCollect users who have BOXBOY! in their Sell List. This is a list of VGCollect users who have BOXBOY! in their Wish List.